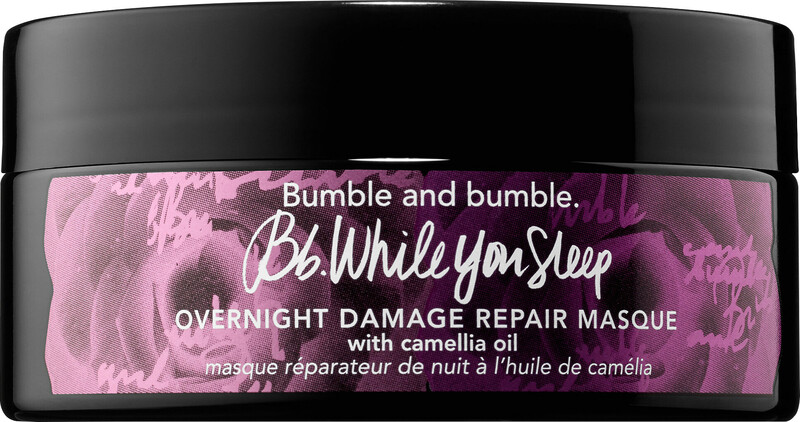 Change your hair’s destiny with the Bumble and bumble While You Sleep Overnight Damage Repair Masque, a repairing, strengthening and nourishing hair mask for damaged tresses. The Bumble and bumble While You Sleep Overnight Damage Repair Masque works overnight to fortify and reduce breakage thanks to added evening primrose oil which is rich in essential omega-6 fatty acids. The perfect ally for colour-treated, dry and damaged hair, the nourishing treatment will revive hair from roots to ends for silky-smooth hair that’s happy and healthy. Designed to work immediately and over time, the boosting masque will also provide hair with protection against heat and UV rays. Apply to dry hair once or twice a week. For deep nourishment, leave on overnight, then wash out in the morning with your favourite shampoo and conditioner. For best results, use in conjunction with the Bumble and bumble Save the Day Daytime Protective Repair Fluid. Camellia Oil: Rejuvenates and restores. Advanced Hair Repair Technology: Helps repair split ends and restore hair's healthy look and feel. -Evening Primrose Oil: Nourishes with omega 6 fatty acids. Water, Cetearyl Alcohol, Propanediol, Caprylic/Capric Triglyceride, Behentrimonium Methosulfate, Dimethicone, Ethyl Macadamiate, Stearyl Alcohol, Dicetyldimonium Chloride, Stearamidopropyl Dimethylamine, Ceteareth-20, Panthenol, Polyquaternium-37, Glycerin, Hydrogenated Castor Oil/ Sebacic Acid Copolymer, Lactic Acid, Perilla Ocymoides Seed Extract, Oenothera Biennis (Evening Primrose) Oil, Punica Granatum (Pomegranate) Seed Oil, Sisymbrium Irio Seed Oil, Camellia Oleifera Seed Oil, Isopropyl Alcohol, Caprylyl Glycol, Hydrolyzed Vegetable Protein PG-Propyl Silanetriol, Tocopherol, Hydrolyzed Wheat Protein PG-Propyl Silanetriol, Behenyl Alcohol, Silica, Ethylhexyl Salicylate, Ethylhexyl Methoxycinnamate, Butyl Methoxydibenzoylmethane, Fragrance, Citral, Limonene, Sodium Phytate, Phenoxyethanol, Potassium Sorbate, Mica, Titanium Dioxide.